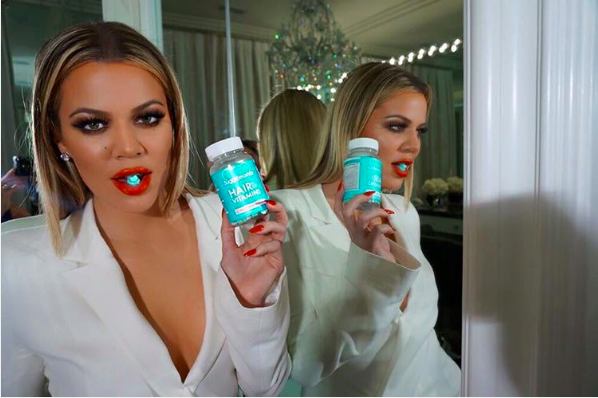 Kim, Kendall and Kylie can’t get enough of SugarBearHair's bright-blue gummy vitamins, but lab tests say what’s inside is not what’s claimed on the label. 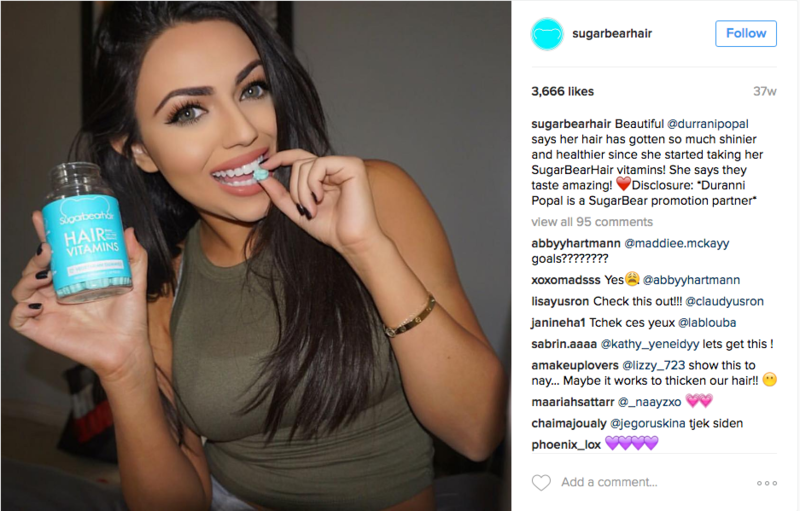 SugarBearHair vitamins, promoted on social media by celebrities like Kylie Jenner and Kim Kardashian, make “largely inaccurate" nutrient claims on their labels, according to testing by a lab that analyzes nutritional products. But the gummy-bear vitamins still earned an overall A-grade for having the amount of vitamins and minerals a person needs to compensate for nutrient deficiencies that affect hair growth, said Labdoor. 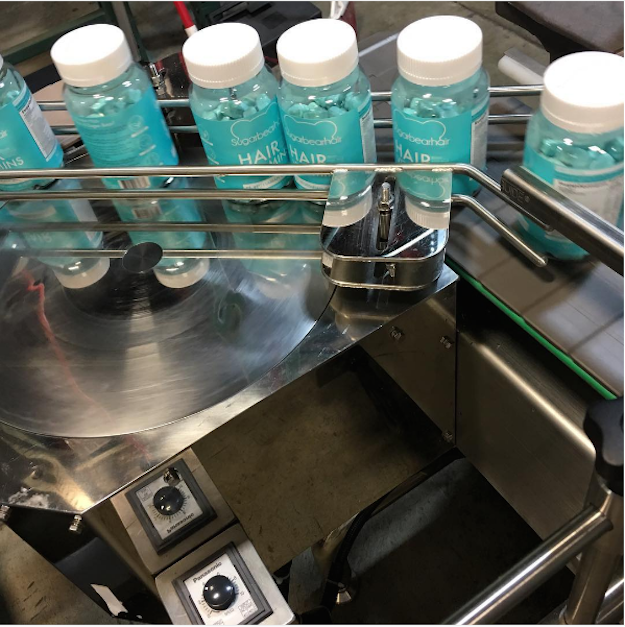 Labdoor, a San Francisco-based lab that tests and grades dietary supplements, found that the listed quantities of 7 of the 11 nutrients listed on the SugarBearHair were inaccurate by 20% or more. It also found the vitamins had “relatively high” levels of lead compared with other hair supplements tested by the lab. 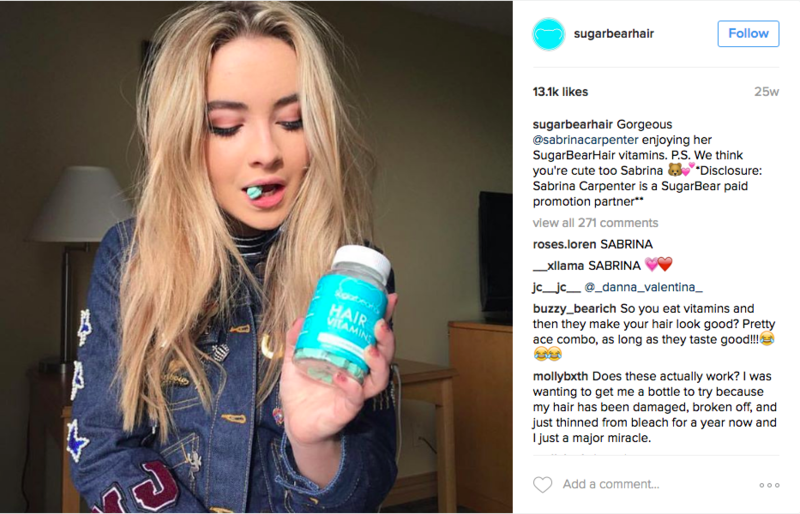 While still a relatively young company — it registered as a Florida-based business in May 2015 — SugarBearHair and its little blue gummy vitamins have become well known to social media users, thanks in large part to promotion on Instagram by celebrities like Kylie Jenner, Kim Kardashian, and Khloe Kardashian. "These chewable gummy vitamins are delicious and a favorite part of my hair care routine"
SugarBearHair, which manufactures the vitamin in California, told BuzzFeed News that the company has “well over 100 lab test results performed by accredited independent laboratories” that show the product is “well within” Food and Drug Administration and California guidelines. Labdoor’s testing found the bears contain 70% more biotin than claimed on the label and about 75% the amount of vitamins B5 and B6, which have been associated with hair growth. The gummies also contain about 26% less Vitamin E than what the company claims on the label. Arthur Grollman, a professor and director of Stony Brook University School of Medicine’s Laboratory for Chemical Biology, told BuzzFeed News that the vitamin’s label inaccuracy “reflects the lack of regulations” of the dietary supplement industry, which is not held to the same strict government standards as the pharmaceutical business. Labdoor measured 8,497 micrograms of biotin in one serving the gummies, 70% more than claimed on the label; 10.3 micrograms of B12, 72% more than on the label; and 3.5 micrograms of B6, 73% more than the label. All B vitamins, including biotin, are water soluble, which means the body will naturally excrete any unused nutrients, according to the National Institutes of Health (NIH). That means having an excess of B vitamins and biotin does not necessarily make the vitamin more effective or unsafe because the body will release any amounts it doesn’t use, said Mark. Research collected by the NIH suggests adequate intakes for biotin are 25 micrograms for adolescents 14 to 18 years old and 30 micrograms for adults over 18 years old. Labdoor also found the blue gummy bears had “relatively high” lead levels. The tests found 0.075 ppm of lead in a serving size of two vitamins, which is below the federally recommended maximum level of 0.1 ppm in candy consumed by small children. 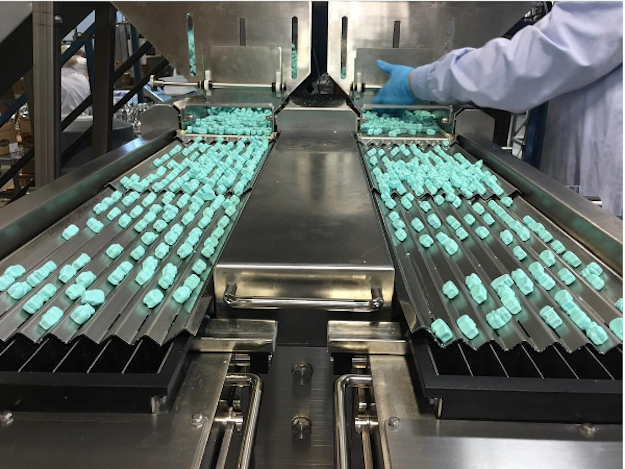 But while the company recommends eating two of its vitamin chews per day, Labdoor says its test results show that eating just one more than the recommended dosage would cause users to exceed California’s Maximum Allowable Dose Levels. Those levels, referring to individual dosages contained in products, are far below what researchers estimate is the overall average daily intake of lead, a naturally occurring element that is present in trace amounts in water and throughout the food system. The FDA has estimated adult women can tolerate a total intake of 75 micrograms of lead per day; for young children it estimates the limit at less than a tenth of that. 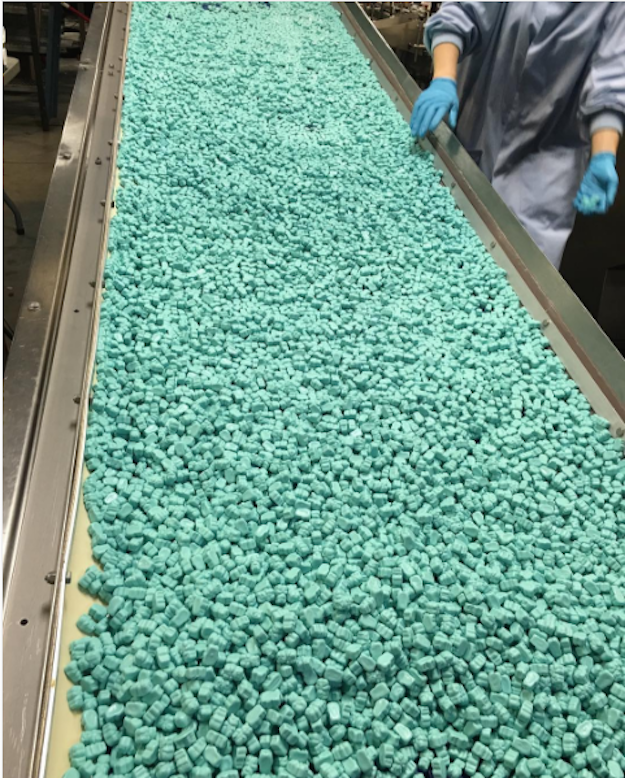 California limits individual dosages in a product to 0.5 micrograms, and Labdoor’s results found two SugarBearHair gummies contained 0.38 micrograms, with a third tipping the dosage over the California limit. “Levels of heavy metals and other contaminants are not going to be reported on labels,” he said. Duffy MacKay, senior vice president of scientific and regulatory affairs with the supplement industry group Center for Responsible Nutrition, told BuzzFeed News that it’s common to see discrepancies between a label and the actual content of a supplement. It’s not “uncommon for manufacturers to put a little bit of overage,” he said. Vitamins and minerals naturally degrade over time and that process can be accelerated by exposure to light and other nutrients, he said. The FDA, which regulates dietary supplements, does not require companies to get the agency’s approval of their product before going to market, agency spokesperson Lyndsay Meyer told BuzzFeed News. Companies do, however, need to register as a manufacturer with the agency, adhere to good manufacturing practices, and meet labeling requirements. They must also meet the agency’s standards for nutrient claims. But with a staff of less than 24 people to regulate an industry worth an estimated $36.7 billion, the agency has focused its resources on cracking down on unsafe products, said Meyer.